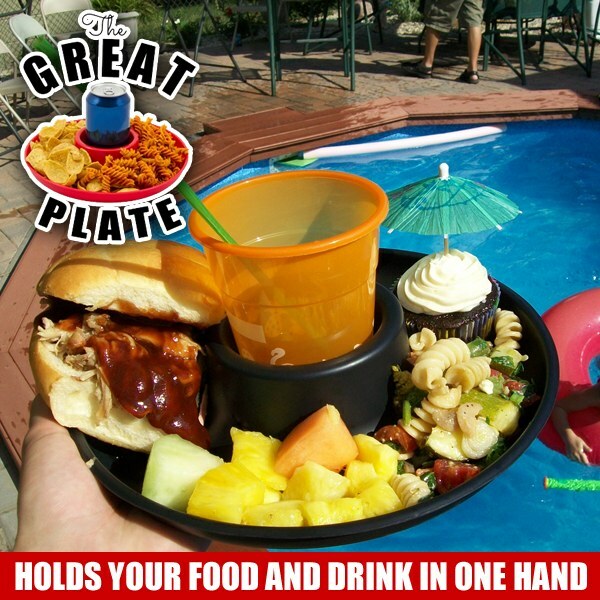 Hold food and drinks in one hand with the Great Plate! Easily holds food and variety of cans, bottles and cups. Hold and carry food and drink with one hand. Great Plate is perfect for wherever food and drinks are served together. With one hand you can enjoy your food without leaving your drink. Frees up your hands to eat and drink. Great for tailgating, BBQ, picnics, parties, lunches, poolside, sporting events, buffets and more. Works great for kids and adults of all ages. Works great for coasters on the couch or floor. The center is large enough to hold cans, bottles, solo cups, double insulated tumblers, and more. And these aren&apos;t those cheap disposable plates either - Great Plate is a sturdy, reusable ABS plate! When the party is over, throw them in the dish washer and they&apos;ll be ready to use again next time. NICE set of VERY DURABLE plates! Should be GREAT for picnics, and any other outdoor activities! Good for holding various snacks & drinks safely! I love these plates. Just in time for camping season.